Need an Oil Change in North Raleigh? Come to TransMedics! At TransMedics, we like to call ourselves the ER for your car because we’re there to help fix your car should any minor or major repairs be needed — but we’re not just there for your ride when things go wrong. That’s because we also provide the maintenance service your vehicle needs over the course of its working life — including oil changes. We are a trusted, local source for oil changes in Raleigh, NC. Vehicles owners from throughout the Triangle visit our family-owned and operated auto shop because they know they’ll receive the best oil change they can get from people who will treat their automobile like it’s their own. Buildup of corrosion can lead to a multitude of engine problems — even eventual failure. 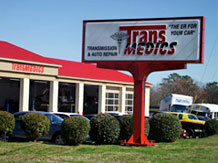 Don’t go down that road — come to TransMedics for a car oil change in Raleigh, NC. Our auto shop, located near the corner of Millbrook and Old Wake Forest in 27609, is the only place you should take your car to receive an expert oil change from people who truly care about its performance. While it’s true that technological advances have resulted in the improvement of motor oil technology, we still steadfastly recommend the 3k to our customers — plus a tire rotation every other oil change. Why? First of all, keeping clean oil in the car is good for it. Additionally, bringing the car, truck or SUV in every 3,000 miles allows your vehicle to be seen by our experts, which can, in some cases, help catch minor issues before they blow up into huge problems. Need an oil change? Boost your engine’s life with an oil change from the professional mechanics at TransMedics. Schedule an appointment, or simply come on by during our normal business hours to receive a thorough oil, lube and filter service!